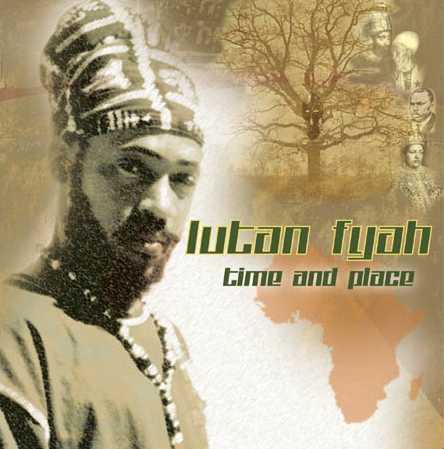 After one listen of Lutan Fyah’s latest LP release, “Time and Place,” you’ll agree that Lutan Fyah should be more than deserving of being mentioned in the same breath as other newcomers such as I Wayne and Natty King. In time, he might well fare alongside veterans such as Capleton, Sizzla and Jah Cure. On the opener, “Don’t Waste your Time,” Yami Bolo joins in for a great start to this album, and it’s important to note that at no point throughout the album is there any decrease in value for your enjoyment. Produced by a talented and dedicated crew of conscious dancehall technicians – Zion High, Digital Ancient, Moon, Dr. X and King Corrin – this album includes Lutan Fyah’s behind-the-scene help on the boards on a few tunes. Over the “Fortune Teller” riddim, he pleads “No More War,” then as the organic horns and sound of the trumpet shed a glorious feel on “As Long as Life Lasts,” Lutan sings and switches back and forth in his raucous and then sometimes refined grace, varying tones and adjusting each emotion to relay his message. On “Speak Softly,” the Lovers Rock feel sets a mood, as he cools his flow to grab full attention from his empress. Something Lutan considers very important is living “Stress Free” which is actually his buzz tune on the “Liberation” riddim that you may know alongside another, “Rise and Shine,” both of which found themselves on the Lustre Kings vs. Project Groundation “Calling All Jah Children” compilation earlier this year. However, the newly, excellently produced songs such as “She’s Like the Rainbow” where Lutan’s addictive chorus-hook will have you repeating in your head – “I met her in San Francisco, I’ll never forget that stage show” – commands your attention for a nice ride to make this album one of the best 2005 has to offer so far in the conscious dancehall category. The CD presents other notable songs such as “Streets of the Ghetto,” “Woman of Principle,” “Ithio First” and his undeniable acoustic “Love is the Absolute,” that displays his raw deejay and singjay talent without the support of a tough riddim to cushion him. Tune in to the self-proclaimed ‘Selassie I’s brand new recruit’! This CD is available for purchase from Ernie B’s online store.